Tasty Spot provides a marketplace where people who seek to find, buy and pick-up food from street food vendors and mom-and-pop restaurants can locate a vendor, select the desired items and purchase directly from the vendor through an easy to use platform. Your customers will enjoy a better experience using Tasty Spot. 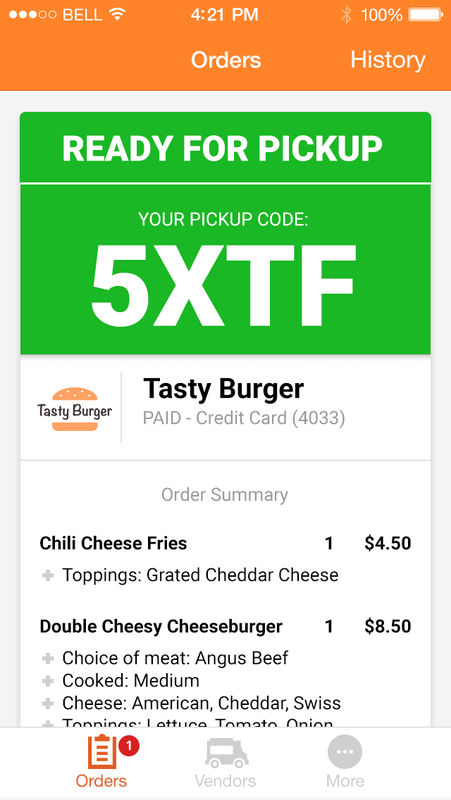 Avoiding long ordering lines, secure payments, order pick up codes, and knowing when their food will be ready are just a few of the benefits you can now offer your loyal patrons. You'll leave them satisfied and wanting to come back for more! Tasty Spot is built around making you, your business, and your food look as good as possible. Build you menu with beautiful images showcasing all your food has to offer combined with a dazzling description and any possible order options you'll need to offer. Tasty Spot will even come out to help with professional photos of your business! You, the vendor, will have a larger customer base which leads to higher revenue. You will receive free promotion and streamlined operations. There is no upfront cost or monthly fixed cost. In exchange for our services, we earn a service charge based on a percentage of the customer order. Tips are all yours! The customer is still responsible for tax, and you, vendors, remain responsible for the processing fee, and all of these are conveniently processed together at the time the customer pays, which is when they order, so no worries about wasted food at the window. The app is free and it's available for iOS devices on the Apple App Store and Android devices on Google Play.